I was packing the kids’ lunches today, putting in a pack of granola bars as I normally do, when I became curious. 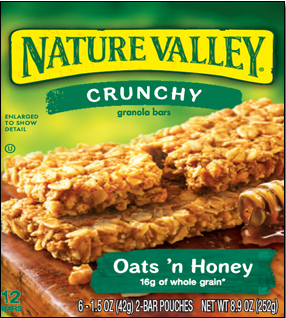 These Nature Valley “Oats ‘n Honey” granola bars from General Mills are tasty and have an appealing photo of the bars next to a fat spatula dripping with honey goodness. See that? 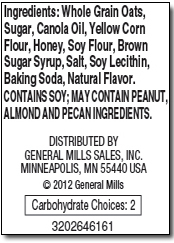 The second most common ingredient behind oats ain’t honey, baby, it’s sugar. The honey comes behind oats, sugar, canola oil, and yellow corn flour. So, in light of the actual ingredient mix of this product, do you think it’s fair to call these “Oats ‘n Honey” or would “Oats ‘n Sugar” be more accurate? While there is honey in this snack, it seems to me that maybe the federal government needs to regulate the way food manufacturers market their products when it comes to how much sweeteners are being used. Also, while I would like to see more honey than sugar in a product called “Oats ‘n Honey,” I’ll give General Mills some credit for using actual sugar rather than high fructose corn syrup. A recent study ties sugar intake to heart disease. Obesity and heart disease are two major health issues in this country. Maybe it’s time we require our food labeling to be more upfront on the amounts and types of sugars they put in their products. Update 8 April: Boom! The FDA is putting a stop to this nonsense. Yay!